The object of this straightforward game is to place a bet on the hand which will get a point total closest to 9. If the value of your cards is higher than ten, you subtract 10. If you have a 9 and an 8, your hand totals 7 (after subtracting 10). The best outcome is if you get 9 with your first 2 cards. Eight is good too and it also counts as a natural hand. There are two hands given out: the hand of the Banker and player's hand. Both the banker and the player are dealt two cards, and depending on the value of the hand, might be dealt a third in either case. The task for you as a player is to place a bet on the banker's hand, the player's hand, or a push, which means that the two hands are tied. Baccarat odds are quite low. If you bet on player, the house edge is 1.36%. If you bet on banker the house edge is 1.17%. 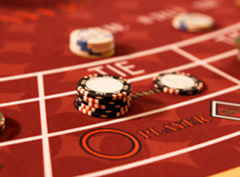 Each player deals with 3 areas to bet at, corresponding to the choice when the game starts: "Banker", "Player" or "Tie". Payouts are understandable. If you bet on Player's hand, the payout is 1:1. If you bet on Banker’s hand, the payoff is as well 1 : 1 but mind that the casino has 5% commission on this outcome. If you bet on a Tie, you are paid 8 to 1. The min bet is one dollar and max is $500. If the Banker’s initial hand totals to 0, 1 or 2 - Banker has to take one more card. If the Banker’s hand totals 3, and player's 3rd card is any card but 8 (the player gets his cards before the dealer),the Banker hits. If Banker’s hand is 4 and Player's 3rd card is all but 1, 8, 9, or 0, Banker gets third card. If the Banker’s hand equals 5 and Player gets a 4, 5, 6 or 7, Banker will hit. If the Banker’s hand is equal to six, and 3rd card of the player is 6 or 7, Banker will hit. If the Banker’s hand is 7 or greater, the Banker must stand. If Player's initial hand totals 6 or more,he should stand and should not get any additional cards. If Player’s hand is 5 or less, Player is given out another card.